My grandma was one stylish lady. She was always impeccably dressed, in tailored suits, loads of costume jewelry, and spectator pumps. I can rock a suit on job-interview days without a problem and costume jewelry (most of it my grandma's) is a way of life for me. 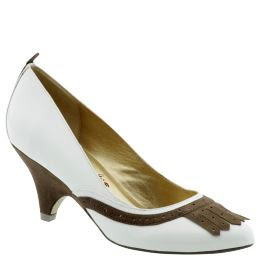 But I've never been able to pull off spectator pumps; I've always found them a bit too prim and proper for my taste. 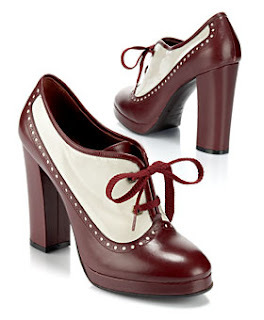 But with all the '20s-inspired Bonnie & Clyde looks for fall--and the chunkier reinterpretation of the spectator pump--I think it might be time to give it another try, especially with all the delicious options here. This Moschino pump has a classic look that would work in even the stuffiest Midtown office. And, you know, I think even my grandma would approve. With its lace-up detailing, this Marc Jacobs pump is more of a bootie, but I love the chunky heel and the neutral metallic coloring. Plus, it's less fussy and a lot cooler than the typical spectator. 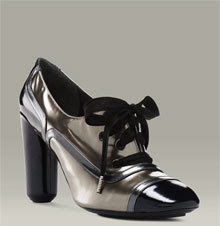 Do you remember when Miu Miu shoes were somewhat affordable? Even though in recent seasons they've ventured into ultra-pricey territory, I think shoes like this madcap patchwork pump are definitely splurgeworthy. If I had to pick a favorite type of shoe, it would be the Mary Jane--I find there's no shoe that better combines sexiness with sweetness. 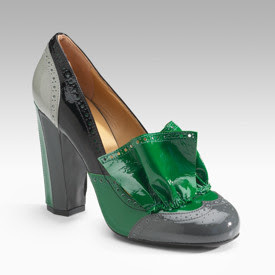 Which is probably why I find this spectator Mary Jane from Barneys so irresistible. I've been debating whether to put this Marc by Marc Jacobs two-tone pump pump in the shopping guide, because I can't decide whether it's fab or fug. 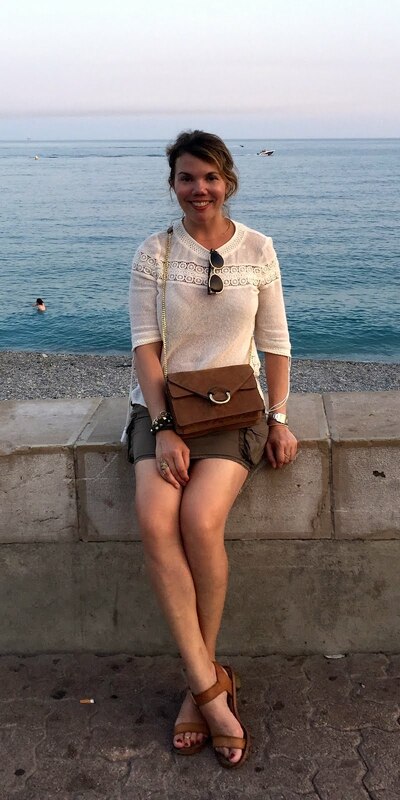 But I've noticed in the past that whenever I have this internal debate about a pair of shoes and end up buying them, I always get a lot of compliments on them. So there you go. 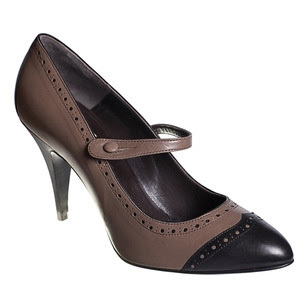 Betsey Johnson's Walsh pump is a slightly more streamlined, feminine version of the above look. I'm always a fan of the hidden platform, and the pink sole is a fun touch. I like the little bit of fringe on this Poetic Licence pump--it's a little bit golf course, a little bit Great Gatsby. 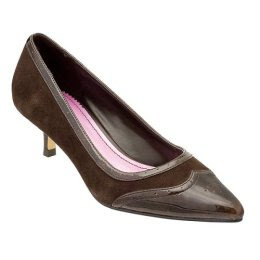 This Isaac Mizrahi for Target pump is so simple, you can't go wrong (the price is right too). The neutral, tonal coloring is perfect too for those who want to try the look without going too extreme. But my favorite style overall is, believe it or not, this Mary Jane from the Alloy catalogue. 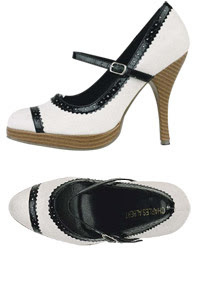 As I said before, I can't turn down a good Mary Jane, plus the stacked platform gives it a youthful look. And for $30, I feel like you can't pass it up. I think even my grandma might like it.